Today we reveal the time frame of the next recession — to within three months. We are informed the partial government “shutdown” has entered a record-extending 25th day. It is information we must take on faith, and at second hand. That is because we have suffered not the slightest disruption to our affairs… nor has anyone within our orbit. We would prolong the calamity until the very last cow reports to the butcher… or the first honest politician reports to Washington. That is, we would prolong the calamity permanently. But those more publicly minded insist we are mistaken. They claim the shutdown is already casting a shadow, broad and heavy, over the United States economy. Over 800,000 federal employees have been thrown from the public payrolls, they argue. And the economy is deprived of their labor’s fruit. Private contractors who guzzle from the federal trough are likewise going thirsty. In turn, so are merchants downstream of the central catastrophe. We estimate (the shutdown) will reduce first-quarter real GDP growth by approximately 0.5 percentage points. Of this, about half will be due to the lost hours of government workers, and the other half to the hit to the rest of the economy. All furloughed federal employees will be issued full back wages once the “shutdown” ends. And all water drained from first-quarter GDP will go back in the tub. Meantime, the paid vacationers can snooze deep into the day, laze before the television, munch popcorn… secure in the knowledge that all back pay is due them. But to return to the question under consideration… the time frame of the next recession. Global growth is coming to a crawl. Chinese exports have plunged to two-year lows. December imports also dropped 7.6% — a portent of softening domestic demand. Meantime, European factory output wallows at three-year lows. If we use global industrial growth as a proxy for global economic health, Zero Hedge reminds us, the world has almost certainly sunk into recession. The United States economic machine still runs forward. But at a reducing rate. Morgan Stanley, for example, projects U.S. growth will slip to 1% by 2019’s third quarter. All the while, growth of global central bank balance sheets went negative last August. 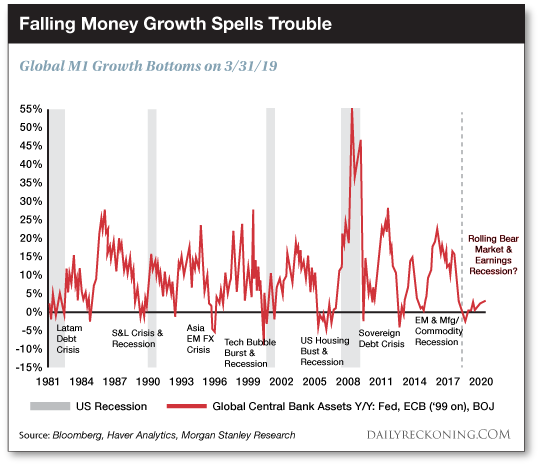 Bank of America reports global money growth (measured by M1 money supply) nears its lowest point since mid-2008. So is recession dead ahead… like an iceberg in the North Atlantic night? The Federal Reserve has essentially announced a halt to its rate hikes. A March hike has already been removed from the card table. Later hikes are also in question. But will it be enough to sustain the show? Once a global slowdown becomes obvious even to the Federal Reserve, it may be forced to take one additional step… and actually cut rates again. That will be the point we suspect recession is close. But is it not common knowledge that Federal Reserve tightening precedes a recession — not loosening? Yes, but monetary policy features a delayed fuse. Previous tightening will have already worked its damage. By the time it is appreciated, it is time again to back off. The Fed begins cutting rates. But it is too late. The past three recessions followed within 90 days of the first rate cut that ended a hike cycle. While many analysts will caution that it is the Fed’s rate hikes that ultimately catalyze the next recession and every Fed tightening ends with a financial “event,” the truth is that there is one step missing from this analysis, and it may come as a surprise to many that the last three recessions all took place [within] three months of the first rate cut after a hiking cycle! 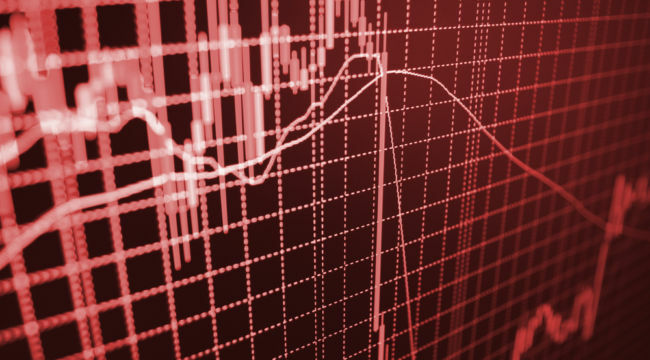 Does the rate cut itself frighten the horses… and turn a slowdown into a rout? One can argue that it was the Fed’s official admission of economic weakness — by cutting rates — that triggered the economic contraction that was gathering pace as a result of [previous]higher rates and tighter financial conditions. The next recession will commence within three months of the next rate cut.